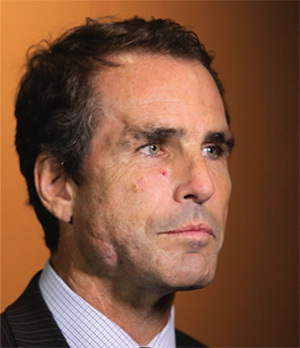 Joining Lidia at Norfolk is ABC news anchor Bob Woodruff. Covering the Iraq war, Bob was injured by an Improvised Explosive Device (IED) in 2006. Woodruff sustained severe head injuries and shrapnel wounds, and was rushed to the neurosurgical team at the US Air Force Hospital. Swelling in his brain necessitated a medically induced coma for 36 days following his injuries – and for close to a year afterward, Woodruff still ‘lost’ words, and had to relearn to walk. It would be over a year before he could return to the air. As someone who experienced the Iraq War on the front lines, and sustained injuries during his time there, he brings a unique insight to the conversations he and Lidia share with the servicemen and vets on Norfolk Naval Base.